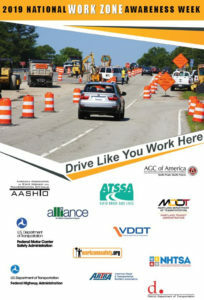 As part of the USA’s National Work Zone Awareness Week (April 8-12), Israeli company Nexar will be demonstrating its connected vehicle platform at an event in Las Vegas, where the city is piloting the technology to detect construction zones in real-time and improve traffic flow. In an ongoing effort to reduce traffic congestion and slowdowns caused by roadway construction zones, the Regional Transportation Commission of Southern Nevada (RTC) is testing various technologies to find, inspect and mitigate work zones in real time. These technologies will be on display at a ‘Work Zone of the Future’ event, held on April 10 the RTC Traffic Management Center. Temporary road construction zones, a result of the recent regional development surge in Nevada, are managed by a network of contractors across multiple jurisdictions, government agencies, utility companies and private developers. Often changing on a daily basis, the RTC faces a challenge to obtain timely, accurate information about construction zones, and how they are affecting traffic. 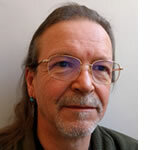 Since December 2018, the RTC has been using Nexar’s CityStream platform and connected vehicle network to both access real-time updates on the location of construction zones and get timely insights about their effects. 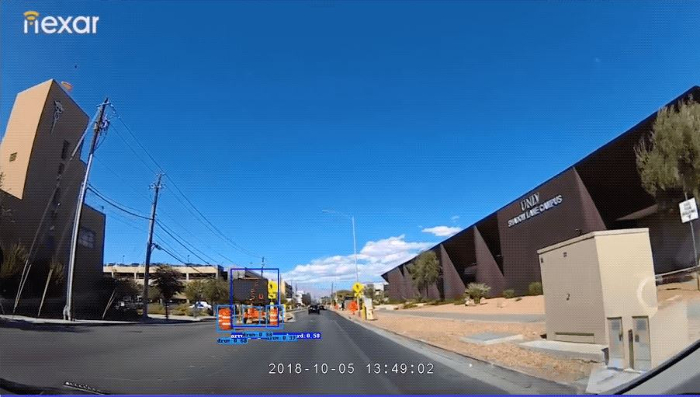 In the three-square-mile pilot area in and around downtown Las Vegas, Nexar has logged thousands of daily updates on the movements of hundreds of traffic cones and received critical insights on their effect on traffic. The RTC is extending and expanding the scope of the Nexar pilot to further measure the effects of cones and lane closures on traffic, automate the flow of data into RTC databases, help determine permit compliance with lane closures, streamline construction permit management, and other applications. 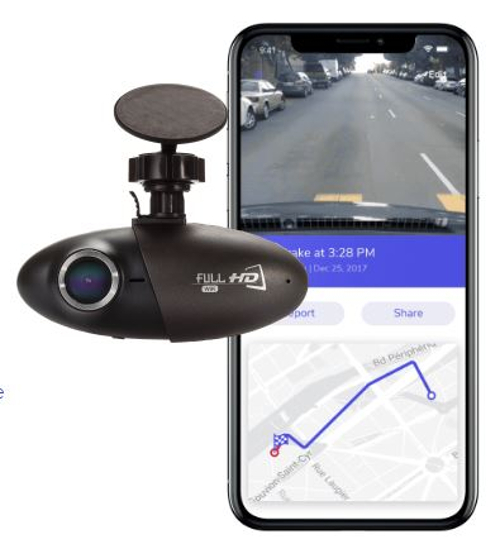 Nexar makes dash cameras smart by pairing them with the Nexar app to connect drivers to the world’s first cellular-based vehicle-to-vehicle (V2V) network. This network collects real-time roadway data to help drivers on their journeys, while the aggregated, anonymized data helps municipalities make data-driven decisions to make roads better and safer. 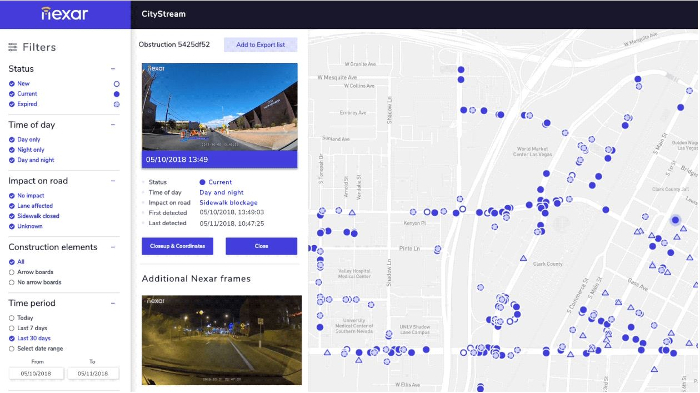 Nexar’s CityStream makes use of artificial intelligence and delivers anonymous, aggregated network data from tens of thousands of connected vehicles to cities, transit authorities, and mobility and mapping companies to improve road network performance. CityStream can address specific needs including evaluating how construction zones impact traffic patterns, monitoring signage and infrastructure, and identifying causes of congestion and other dangerous road conditions.